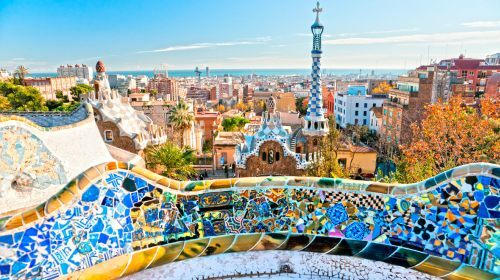 British Airways has dropped the price of some of their flights from Vancouver to Barcelona, Spain down to $685-$695 CAD roundtrip including taxes. There aren't *too* many dates available for this one, so it may sell out fairly quickly. late March to mid May 2016 and mid October to early November 2016. Being further south in Europe, Barcelona has highs of around 20-22C in late April/May and October. IMPORTANT: This fare involves transferring yourself from London Heathrow to London Gatwick during the 5.5 hour layover on the way there. You also need to collect your luggage at Heathrow and take it with you to Gatwick. Vancouver to Barcelona, Spain - $731 CAD roundtrip including taxes. Or Lisbon, Portugal for $749. vancouver, yvr, flight deals, spain, western europe, southern europe, barcelona, bcn and british airways. 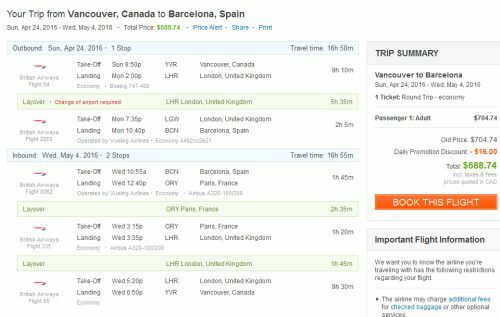 4 Responses to "Vancouver to Barcelona, Spain - $660 to $695 CAD roundtrip including taxes"
Hi Chris. I'm thinking about booking this flight, but hoping to fly into London and fly back from Barcelona. Are there any negative implications if I "miss" my connecting fly from London to Barcelona on the way? Yes, unfortunately, with any airline ticket, if you intentionally skip a leg, the airline will usually cancel the remainder of the legs on the ticket.